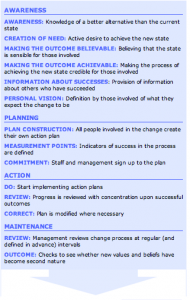 The following model was developed for managing successful change within organizations. Its strength comes from the fact that it is intended to change both the individuals and the organizations they constitute, and realizes that changing one without the other is impossible. 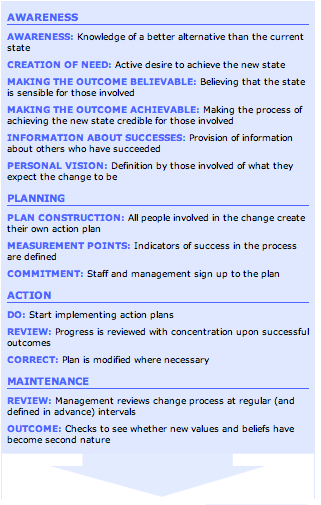 The model puts together the requirements for change of individual beliefs that are so crucial in cultural development. It can apply to safety, but it can also apply to any other desirable development in an organisation. 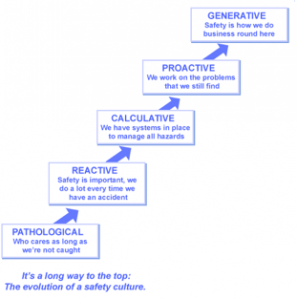 It gives substance to the oft-heard cries for workforce involvement and shows where and why such involvement is crucial, especially in the later stages of evolution towards a full safety culture. Professor Patrick Hudson is recognised internationally for his work on safety management systems. Based at Leiden University in Amsterdam, Netherlands, Hudson is an active member of the ICAO Human Factors Awareness Group, Flight Safety Australia, Sept-Oct 2001.